It is Easy to Customize your DPW Gallery Website! 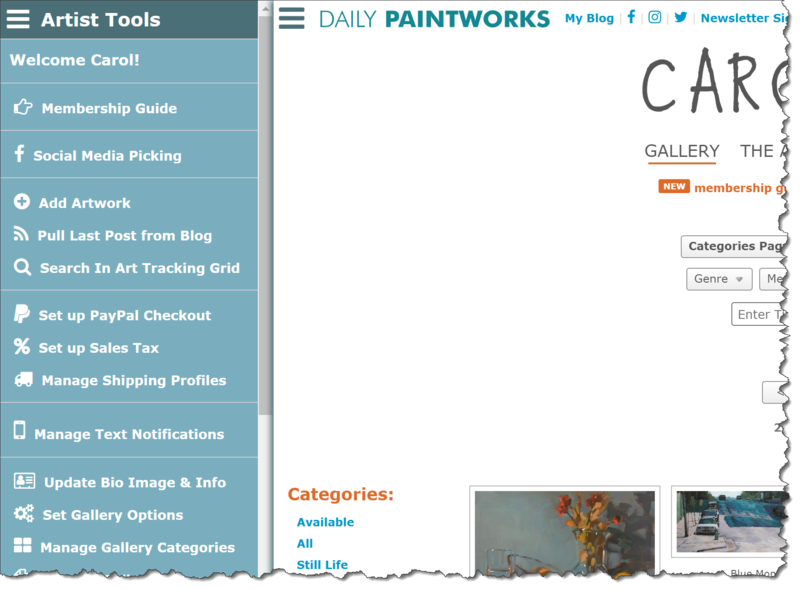 When you are signed into your DPW account, you will see a three horizontal line button for the Artist Tools slide-out menu up at the top of your gallery. It is from this menu you can select the options for customizing your gallery. Without categories, your gallery presents a solid wall of artwork to the viewer organized, by default, by the date published, or perhaps, in the order you may have arranged them. Instead, you can organize your artwork into categories, letting you present your work just as you want and making it easier for your visitors and buyers to find what they are looking for. Important: You don't put artwork in a category, instead you create a category that includes artwork based upon the artwork's genre, media, sold status, or keywords. In this way a given work of art can appear in more than one category. Once created, you can drag and drop your categories in the Categories window to set the order in which they will appear in your gallery. Predefined categories include All , Available , Sold , and Genre and Media -based categories, such as Still Life and Oil . 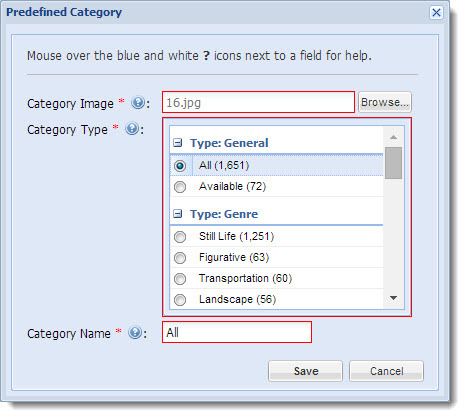 For example, if you create a predefined category with a Category Type of Genre - Still Life then all artwork in your DPW Gallery website with that genre will appear in that category. This is true whether the Category Type is a Genre, a Media, or sold status based, such as All, Available, or Sold. 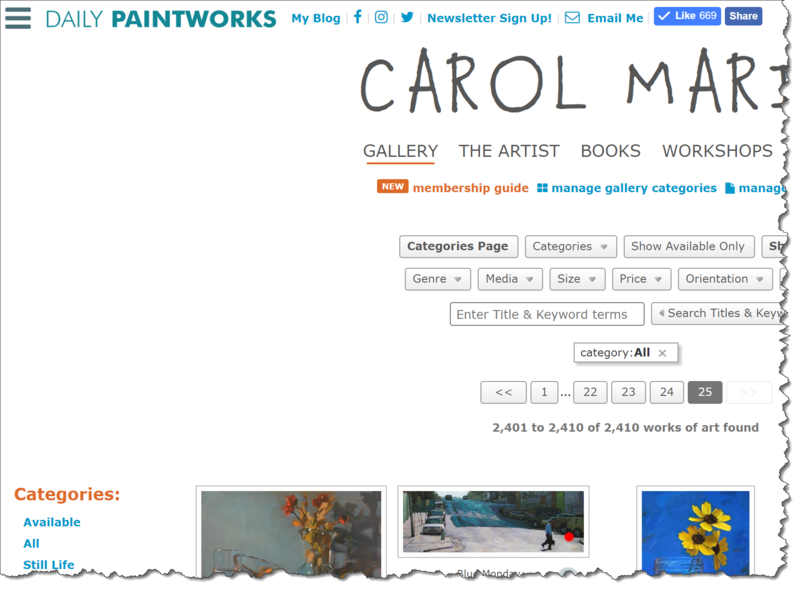 It is with Keyword categories that you are able to make your DPW Gallery truly yours! 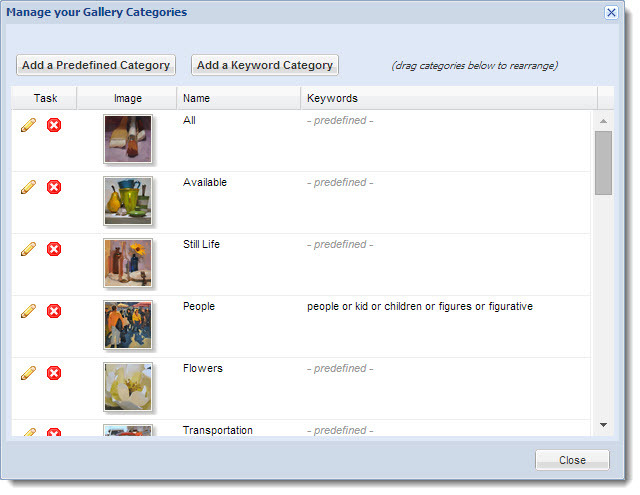 A Keyword category collects your artwork based on the keywords you have assigned to your artwork (see below). 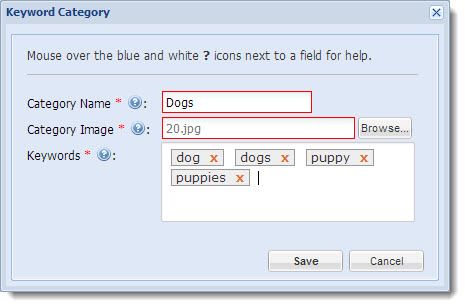 For example, if you create a Keyword category named Dogs and assign the keywords dog and puppy to it, then all your artwork with any of those keywords will show up in that category. Please note the use of the word any . If you have the keywords dog and watercolor assigned to a category, then all the artwork with the keyword dog and all the artwork with the keyword watercolor will appear in the category, which isn't what you would want if you just wanted dogs. Instead, in that case, you should only have the keyword dog . 1. Pulled in from your blog, if you have set up your blog feed. 2. 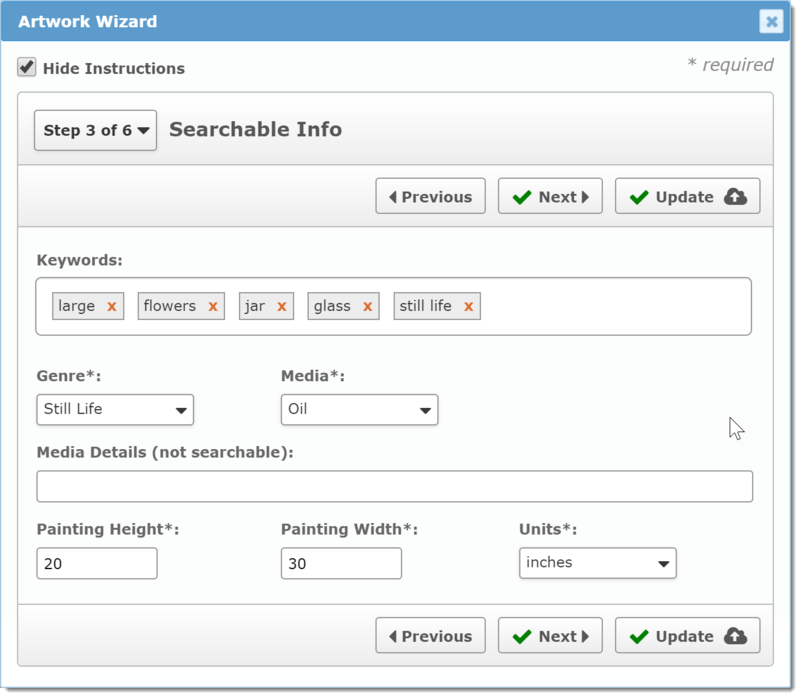 In your Keyword column of your Art Tracking Grid . 3. With the Artwork Wizard dialog. To quickly edit your artwork and set its' keywords, just mouse over a thumbnail of your artwork and click on the little pencil icon that appears. When you click the pencil icon, the Artwork Quick Edit dialog opens where you can quickly change your artwork's image and information. 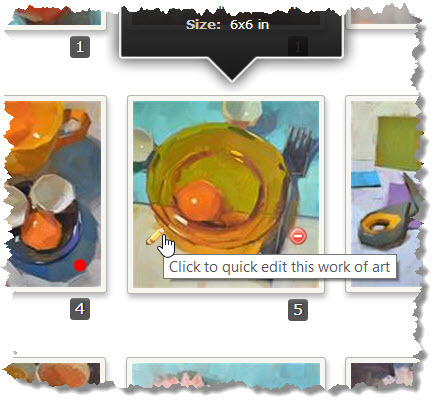 It is an easy and convenient way to change which paintings are in which categories. Just bring up a category in your gallery and you can quickly change the genre, media, and keywords of the artwork in the category, as needed. This approach also lets you have a painting in many categories, if you want. You can additionally make your DPW Gallery yours by setting both the font and color of your name up at the top of your gallery. 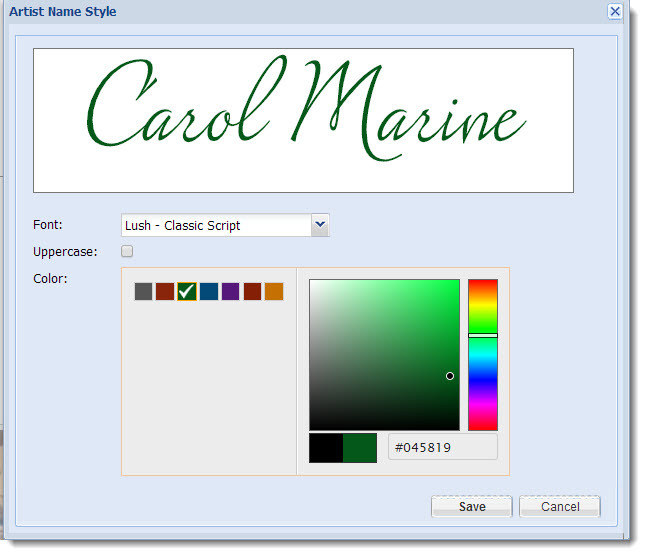 As with setting up your categories, you can access the Artist Name Style dialog from your Artist Tools slide-out menu that is visible at the top of your gallery page when you are signed into your DPW account on a computer or tablet. 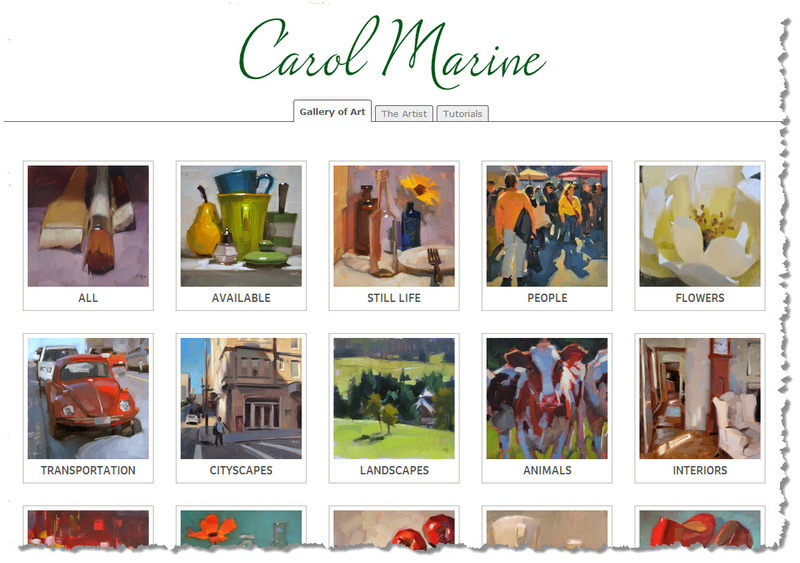 You can further personalize your gallery by using a custom domain name . An SSL certificate is required so your DPW Gallery will have the little secure padlock symbol up in the browser's address bar. This lets visitors know your website is safe and all their activity on it will be private. This is something people have come to expect and Google now encourages by ranking sites without it lower in their search results. Each domain name, including your custom one, requires its own SSL certificate to be installed on your (our) website's web servers. If you host your own website, you would be responsible for both purchasing and renewing a certificate, for around $70 a year, and installing it. No worries, within a day of setting up your domain name to point to your DPW Gallery, DPW will detect it and create and install an SSL certificate just for you, free of cost. And, DPW will automatically renew the SSL certificate indefinitely. First, you need to purchase your domain name from a Domain Registrar company, if you don't already have one. Important: You do not need to pay for any DNS privacy features or web hosting when you register your domain name. This is a bit technical. No worries, your Domain Registrar can help you, if you need, or will have instructions online on how to set this up. It is done differently for each registrar, so unfortunately DPW cannot help you with this. To point your domain to your DPW Gallery, you need to create a couple, what are called, A Records in your DNS (Domain Name System) records. Important: If you already have any of the above A Records, just change the existing record's value to "54.203.33.2" . As with setting up your categories, you can access the Doma in Name Setup dialog from your Artist Tools slide-out menu that is visible at the top of your gallery page when you are signed into your DPW account. It is as simple as entering your domain name and clicking the Save button! This let's DPW route people to your DPW Gallery when they arrive using your new domain name. It can take up to several hours for your updates to your DNS records to make their way around the internet, so you may not see your domain name working immediately. Posted - Tue, May 6, 2014 at 5:04 PM. This article has been viewed 23438 times.